Has Microsoft® Outlook® blocked your attachments? 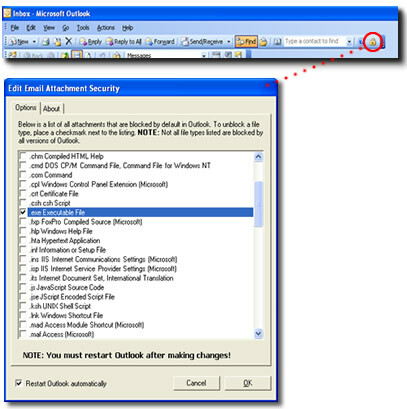 AttachmentSecurity for Microsoft Outlook solves this problem by presenting an easy-to-use interface that allows you to select precisely which file attachment types you want to block or unblock from within Outlook. Because AttachmentSecurity is a Microsoft Outlook addin, you control it directly from within your own copy of Outlook; using it when you need it, while keeping Outlook secure from viruses when you don't. Best of all, it's free to use! To obtain official documentation on Attachment Security visit Microsoft's website at "Cannot open Attachments in Microsoft Outlook"